In the above image, you can see the cross section of a Eucalyptus stem in which air-filled areas appear darker than water-saturated tissues. From the centre outwards, you can see the central pith and primary xylem, followed by a ring of embolised vessels in the outer xylem area. 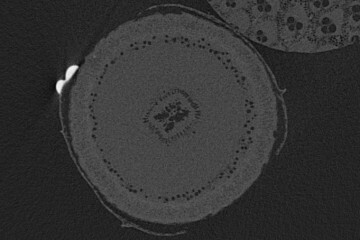 The outermost light-grey lines are peeling strips of bark with a marker spot (white), and the top right of the image shows part of the bamboo rod that stabilized the plant in the scanner.